Software maker will let consumers preorder Windows 7 at a big discount, while offering permanent prices at or below the retail prices for Windows Vista. From Friday through July 11, consumers in the U.S. will be able to buy an upgrade copy of Windows 7 Home premium for $49 or Windows 7 Professional for $99. That offer is good for both XP and Windows Vista PCs, regardless of whether someone has been trying out the pre-release version of the operating system. That matches the details in a memo from Best Buy that leaked earlier this month. When boxed copies of Windows 7 go on sale on October 22, Microsoft plans to charge $119 for Home Premium, $199 for Professional and $219 for Ultimate. The Home Premium upgrade is down $40 from the product’s original price, although the Vista product had already gotten a price cut along the way. The Professional and Ultimate versions are priced similar to where Microsoft was with Vista. The upgrade prices apply to those moving from a previous version of Windows to Windows 7, but only those from Windows Vista will be able to upgrade without doing a clean installation of the product. 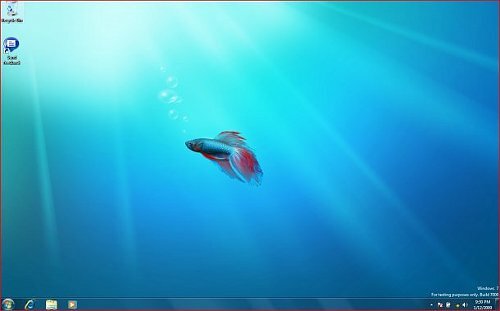 The full versions of Windows 7–the editions for those without a copy of Windows–will be priced at $199 for Home Premium, $299 for Professional and $319 for Ultimate. The Ultimate and Professional editions are again on par with their Vista counterparts, while Home Premium is down from the $239 that Microsoft had charged with Vista. Microsoft also plans to offer the operating system in an easier-to-open box. Windows 7: A return to Windows 1.0? I just found something really interesting that I didn’t know, and I’m not sure how many people know about this. 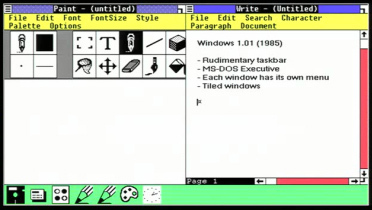 Apparently Windows used to have a feature at the bottom of the screen that showed you the programs that you had open. Not only that, but it pre-dates the Apple Dock by about fifteen years! It even pre-dates NextStep OS by about two years, which is what the Apple Dock was based on. Posted on March 26, 2009 April 4, 2009 Categories Microsoft, WindowsTags Windows 1, Windows 7Leave a comment on Windows 7: A return to Windows 1.0? How many versions of Windows 7 will Microsoft release? 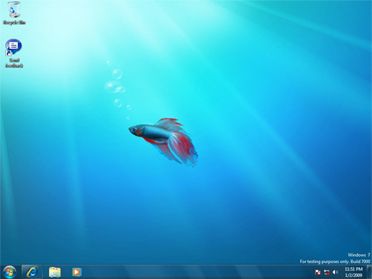 According to the Windows 7 Beta, there will be more than one version of the next Windows OS. I had been hoping that Microsoft would get a little smarter, and release a single version of their operating system, like Apple does with OS X. I suppose we have to wait for Windows 8, or a revolt, for that. I am sure that the variations of the OS is set up to appease the many that have purchased a certain edition in the past, but the problem with releasing so many versions of the operating system is that there no clear difference between the capabilities of each version of Windows. Continue reading How many versions of Windows 7 will Microsoft release? Posted on January 22, 2009 April 4, 2009 Categories WindowsTags Business, Home, Home Basic, Home Premium, Microsoft, Ultimate, Versions, Windows 7, Windows 7 Beta, Windows Vista, Windows XPLeave a comment on How many versions of Windows 7 will Microsoft release? Because of Adobe’s software upgrade policies, I’m sticking with Windows so I don’t have to purchase the whole of Adobe CS4 Ultimate for Mac. Either way, I’ve been happy with Windows, regardless of the forward motion that the Mac OS has made since the release of OS X.
I’ve stuck with XP Pro, and have been anxiously awaiting the direction that was going to be taken with the next version of Windows. Vista, we can all admit, was pretty much dead in the water, where Vista’s SP1 (first service pack) fixed most of the problems that were inherent there.